In the series of CCC Study Material, here is another DOEACC CCC Question Answers Sample Paper SET-D. 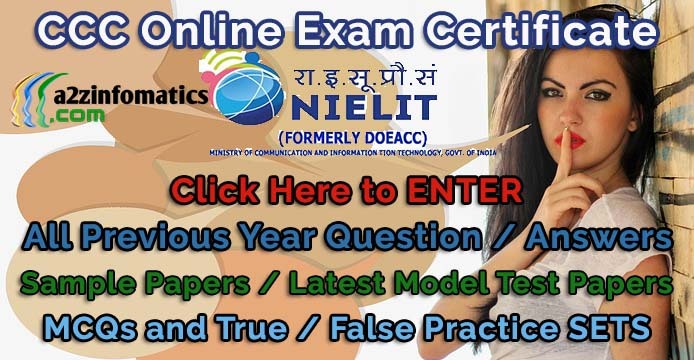 These CCC Previous Year Online Question Answer Paper will surely prove beneficial to all the CCC exam candidates, also it will add another dimension to DOEACC / NIELIT CCC Examination preparation process. To tell you people the truth, cracking CCC Examinations is really very very easy, you just need to go through with the latest CCC Exam Syllabus and must have an authentic collection of CCC Study Material. Best of luck for upcoming CCC Examination. 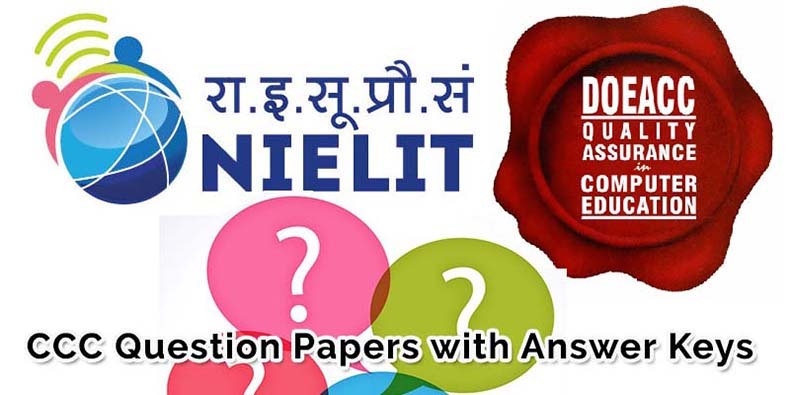 DOEACC / NIELIT CCC Question Answers SET D / CCC Model Sample Paper / MCQ’s SET D.
CCC Question Answers Set D.
Note: This CCC Sample Question Paper (SET-D) consist of total 50 question with the answers at page no 4 of this post. Ques 6- A …………….. is approximately a million bytes. Ques 7- ……………… is any part of the computer that you can physically touch. Ques 10- Which of the following is an example of an input device ? Ques 12- The ……………, also called the “brains” of the computer, is responsible for processing data. (d) Central Processing Unit (CPU). Ques 15- ……………… is a set of computer programs used on a computer to help perform tasks. Ques 16- System software is the set of programs that enables your computer’s hardware devices and ……………… software to work together. Ques 18- Apple Macintoshes (Macs) and PCs use different ……………….. to process data and different operating systems. (a) an input device to produce good quality graphics. (b) an output device to produce drawings and graphics. (c) a fast output device using camera lenses. Ques 20- A …………….. is a collection of buttons which represent various operations that can be carried out within an application. You are now on the Page No 1 of this CCC Question Answers Bank (SET-D). Complete Answer Keys for CCC Previous Year Question Paper Set-D on Page no 4 of this Post.